wait, somebody reads this voice-over blog? 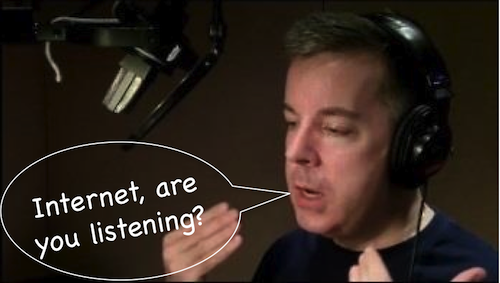 It’s true that when you write a voice-over blog, you’re never fully sure who reads it. It used to be that people used RSS alot. I don’t think they do as much any more. Now bloggers have to post their blog posts on Facebook and Twitter etc., for people to read them. Some bloggers cross post SO much on social media that it looks and feels desperate— ‘read me, love me, validate me’. Ick! I don’t want to be that person as I unconsciously embarrass myself enough. I don’t need to do it in such a planned, public way. So I post blogs in just a few places and forget it. In truth, I don’t really care how many people read the blog…shame on me. But I was reminded in a kind way this week that this blog DOES have at least one other reader besides me. 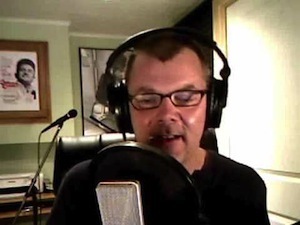 Terry Daniel was kind enough to mention me in a podcast/audio sermon this week. He said something nice about me. I get a mention, he gets a blog post link. Simple as that. 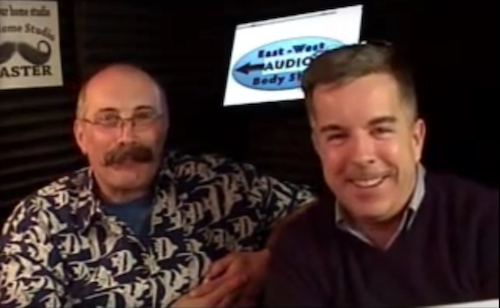 When I wrote the promo blog for my Monday night appearance on Voice-Over Body Shop (formerly known as East-West Audio Body Shop or EWABS), I had the chance to watch a bit of my 2011 appearance. That episode was George Whittam and Dan Lenard’s 4th show and it was a great deal of work for them to get the show on the net, given the tools of the time. But like true broadcasters they worked through it and got the show done. It was a fun time for me to be a part of and especially for the audience. Locales have changed with Dan having moved this past summer from Buffalo, NY to Hollywood and a new studio in his new house. The show originates from this “Lenard Broadcast Center” so finally Dan and George are on the same set. The show has a new name (‘cause Dan isn’t in the East anymore) and the broadcast enjoys much better Internet streaming technology. George has become extremely comfortable as technical director with the newer technology and Dan keeps the flow of the show going very well. 5 years worth of shows will do that. 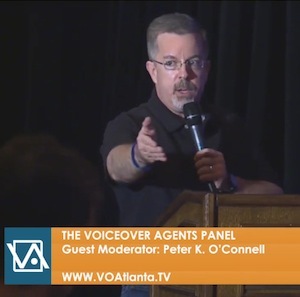 Sponsors have noticed the improved program as well because the show has many of them including (on this episode anyway) Voice-Over Essentials, Voice-Over Xtra, Edge Studio, Source Elements, VO2GoGo & Antland Productions. I was linked in to the show about 30 minutes before air and got to have a nice visit with George and Dan, discussing how much the show has evolved. Certainly with any broadcast, that’s going to happen. However, from my perspective as an early guest on show #4 to my latest appearance 5 years later, the show has experienced a wonderful evolution from two well-paired co-hosts who are not just committed to their show but, even more so, to their audience. So if you didn’t get a chance to see the show live, here for your viewing pleasure is last night’s broadcast. Thanks boys. And happy 5th anniversary. It’s probably tough to get guests with the Easter holiday coming up. Which is why I think I was booked for this Monday’s Voice-Over Body Shop starring George Whittham and Dan Lenard. If memory serves I was a guest (and a fill-in guest at that) on this show’s 4th episode but it was a very different show back then. Ah wait, here’s the LINK to that show. My recollection was that the show and internet TV technology was very different back in 2011 and not always reliable. Video feeds would go down and shows would have interesting images that stayed up a while during downtimes. I also went out to Dan’s old home in East Amherst, NY to be on camera with Dan within his voice-over studio. Now I’ll be sharing my own feed from my studio. The story of the show, initially called East-West Body Shop before Dan Lenard moved out to Hollywood this past fall, is truly the story of the little show that could. 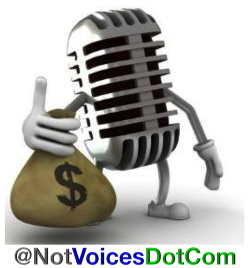 Two voice-over tech guys (Dan also has had a long career as a voice talent) found a niche and really build an impressive following. Along the way, they have interviewed almost every major voice-over personality and executive imaginable, from talents, to producers and casting directors. They took a risk, they worked through the kinks, they re-imagined the medium and made something pretty great. At least part of that show likely won’t be so great. Maybe they can fix it in post.